Based on the stylish fundamentals of the new Lexus ES, the range wouldn’t be complete without a hybrid offering – the ES 300h. A 2.5-liter inline 4 pairs with electric power for a combined output of 215 horsepower, channeled to the front wheels via a continuously variable transmission. The resulting economy figures are a combined mileage estimate of 44 mpg. The ES300h can be had in base form – priced from $41,410 – or in Luxury or Ultra Luxury trims. Ultra Luxury equips 14-way power adjustable seats with heating and ventilation, perforated leather, wood interior trim, and power rear sunshades, and will set you back $45,060 before options, making it an affordable comfort-biased rival to the BMW 530e iPerformance. Instead of chasing apexes I was spreading some of the revamped hybrid’s signature smoothness as we eased silently through the scenery. I had traced the same route earlier in the day, wheeling an ES 350 F-Sport with the brand’s hot-shoe-in-chief, Yoshiaki Ito, riding shotgun and explaining the nuances of his chassis tuning and active suspension system as we dashed through the sticks at highway pace. The road served as the perfect control environment to contrast the sportiest embodiment of the reworked ES and the most comfort-oriented. 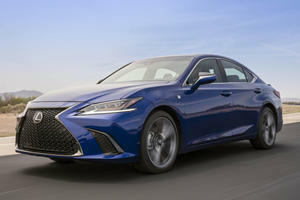 Like other versions of the seventh-generation ES, the hybrid variant is built on the new Global Architecture-K platform, a version of which it shares with the Toyota Camry and Avalon. Because of its new bones, the ES enjoys a 2.6-inch increase in length, a 1.8-inch increase in width; the wheelbase is two inches longer and the front and rear tracks are wider than before. 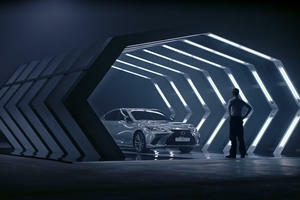 The new platform also let Lexus relocate the battery under the rear bench, which meant there were no compromises in terms of passenger space or cargo capacity like there used to be. 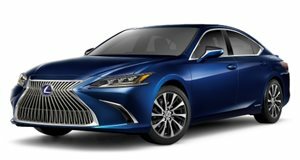 Propelling the ES 300h is the company’s fourth-generation Hybrid Drive System, which pairs a 2.5-liter four-cylinder engine with a smaller, more power dense electric motor than previously, along with a newly engineered hybrid transaxle. Lexus says the total system kicks out a combined 215 horsepower. The new four-cylinder may be of the same displacement as the old engine, but the similarities pretty much stop there. According to Lexus, the cylinder bores were narrowed slightly and the stroke was made longer, which reduces the distance fuel has to travel to the edge of the cylinder, along with increased valve angles which straightens the path for inbound air. The optimized air-fuel swirl then lets Lexus run the engine leaner and with more ignition advance than normal. During regular ops, it runs smoothly and silently, with the transition from electric drive to gasoline power happening with a muffled cough along with the gentle vibration of gasoline being exploded. Unfortunately, the serenity is smashed if you dip into the throttle too greedily with very un-Lexus sounds penetrating the cabin when going to pass or accelerating with vigor. Staying with the technical specifics, there’s a new transaxle which is 1.2 inches more compact than the old unit thanks to a rearrangement of its guts. Lexus has moved to a multi-axle configuration which offers a more direct feeling between the driver and the car’s propulsion. It better matches engine rpm to speed when coming online, which eliminates most of the driveline latency that can make hybrids feel like they’re actually powered by a complex array of paper clips and rubber bands. The nickel-metal hydride battery has been made more power-dense, which allowed engineers to make it smaller and relocate to under the rear seat. On battery power, acceleration is typical hybrid thrust, at speed, the added weight of the battery over the rear axle helps balance a car with so much heavy on its nose. Like the other trims, the ES 300h comes equipped with selectable driving modes. Normal mode is normal, the other two, Sport and Eco, change the cars shift logic, throttle response, and steering feel. They’re made more aggressive in Sport mode, along with an extra laddling of torque upon tip-in, and dialed back in Eco. Additionally, Eco mode will also tone down the air conditioning in order to save that extra little bit of energy. There are paddle shifters with six simulated gears if you want to pretend like you’re doing something productive, but I’d say skip them at all costs. One cool new feature designed to boost the car’s efficiency is a system called Auto Glide Control. In Eco mode, the system works to combat the abrupt drag that comes from the 300h’s regenerative braking capabilities, it behaves more like a conventional torque converter automatic would. If you’re already a member of the one-pedal cult go ahead and turn it off as the car offers a very predictable rate of regen. Moving to the cabin, soothing serenity is the name of the game. Like its siblings, the 300h has sound absorbing material covering 93 percent of its floor–compared to 68 percent on the old model– hybrids get a special triple-layer sound insulation used to fight the high-frequency sounds sent out by the inverters. Nothing changes material wise, there’s a 7-inch instrument screen and the touchscreen interface stretches eight inches across on standard models, 12.3-inches when equipped with the Navigation package. 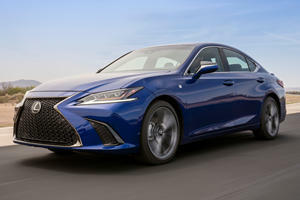 The 2019 ES is the first Lexus product to offer Apple CarPlay capability, along with bringing a connection to Amazon Alexa (for Android and Apple users) which is a respite from the Remote Touch Interface which is how it was to use a Windows Phone. A 10-speaker Pioneer audio system comes standard on all models, while a booming 17-speaker Mark Levinson system is available as optional kit. There’s also included onboard Wi-Fi and Lexus Safety System+ 2.0 as standard equipment, along with the company’s new Lane Tracing Assist Function. Lexus says it expects sales of the 300h will account for roughly 15 percent of the car’s overall sales breakdown, with the company expecting a third of those buyers to be conquested from other brands. Executives say these people will be better educated and make more money. Hybrid models will come exclusively from the company’s plant in Miyawaka, Japan, and should return 44 miles to a gallon of gas, which will make it the most fuel-efficient luxury vehicle across all classes sold without a plug. Look for the 2019 ES 300h to arrive later this year with a price slightly north of its current $42,000 entry point. Next thing we know, AI will be in the dealership selling cars. They're really serious about the "Endless Pursuit of Perfection". The new Japanese luxury sedan is priced aggressively against the competition.